The Dodge Journey is the last of the crappy DaimlerChrysler-era cars in Fiat Chrysler’s lineup. It’s a vehicle that sells based on one fact: It seats seven and costs about as much as a pack of Juicy Fruit. And while I could tell you all about why history won’t look kindly upon the cheap SUV, I don’t need to make fun of the Journey today. Dodge has taken care of that on its website. 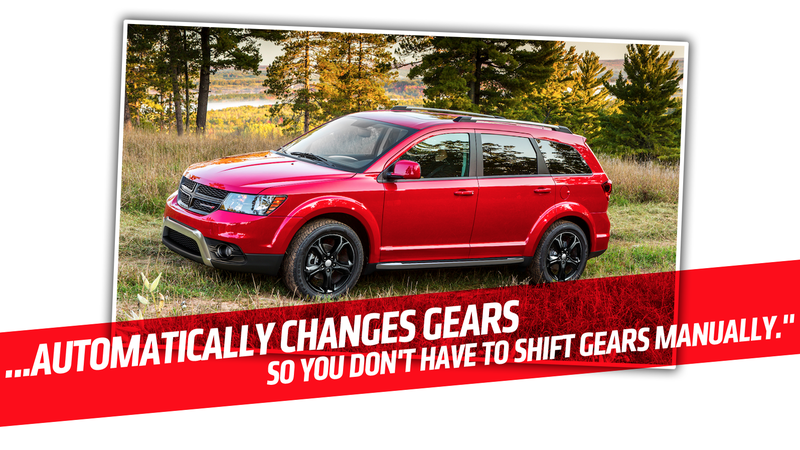 Yes, the base Dodge Journey comes with a four-speed automatic transmission. It’s something you might expect to see in a 1988 Dodge, but certainly not in a car built in 2018, when lots of cars come with eight, nine or 10-speed autos. The six-speed automatic transmission with AutoStick is equipped with a very low first gear, designed to enhance takeoffs from a stopped position. I’ll admit that there’s something honest about Dodge just straight up saying “Hey, it changes gears for you. That’s about it,” but boy, just the thought of a bunch of marketing folks sitting around a table trying to think of something, anything positive to put in the four-speed auto’s description is both funny and sad. The description of the Journey’s 2.4-liter engine says the fuel economy numbers apply to the rear-wheel drive model. But the Dodge Journey comes only in front-drive or all-wheel drive. Not rear-wheel drive. We once wrote an article titled “Did You Know Dodge Still Makes The Journey?” because we were amazed that the vehicle—as technologically antiquated as it was—still remained on the market after all those years. That was in 2015. Three years later, we wrote two more articles about the Journey’s long teeth. But the Journey continues to trudge on, offering dirt-cheap transportation for seven, even shifting gears all on its own. The Dodge Journey: It Still Exists!